Waking up on my thirtieth birthday, I had no idea it would be the beginning of my fairy tale story­—or so I thought. Before I could wipe the sleep from my eyes, I was face to face with a diamond ring dangling from the hollowed out pages of my birthday present. My brain couldn’t register what was going on. I mean, seriously, who proposes to someone before they’ve had coffee? It should be illegal to pose such an important question before the opportunity to caffeinate. The word “yes” eventually made it out of my mouth, and we began planning. But, we make plans and God laughs, right? At first, it didn’t seem like an ominous task. We set the date for the next December, which gave us plenty of time. Before long, we had a church, reception venue, caterer and band. Hey, we were pretty good at this. Then the other shoe finally dropped. I got pregnant. Don’t get me wrong, we were excited, but the timer on our little bun in the oven was set to go off just four days before the wedding! I know, perfect timing, right? Well, with our Christmas wedding out of the question, we opted to move the date back and for the moment it looked as though everything would work out. However, in my experience, things rarely do. A few weeks later, Alex’s father passed away. We were devastated, and his death made us both realize that we didn’t want to wait anymore. We felt compelled to move our wedding again—forward this time. We set the date for June 30th, giving us only two months to prepare. So, let’s talk wedding dresses. I had already picked out “the one.” The only problem was that it had to be made to order and would not be ready until after our new wedding date. We had already paid in full, so I begged the store to use their sample dress but it was useless. In the end, I walked down the aisle in an elegant alternative and now I also have a really expensive nightgown. This is what I get for moving my wedding forward. On to the big day. The ceremony was set for Saint Louis Cathedral and the reception at Alex’s mom’s house in Mississippi. Things started out pretty great. I spent a lovely morning with my mom, Alex’s mom and my bridesmaids getting ready in a gorgeous hotel suite. It’s a memory I’ll never forget. But, like Kanye says, good things don’t last. A protest in the French Quarter had traffic locked down tighter than an Amish chastity belt. I waited and waited, but my limo never showed. What was I going to do? I couldn’t walk to the cathedral in my dress! Did I mention it was summertime in New Orleans? As I began to fall into complete despair, my dad had an idea. 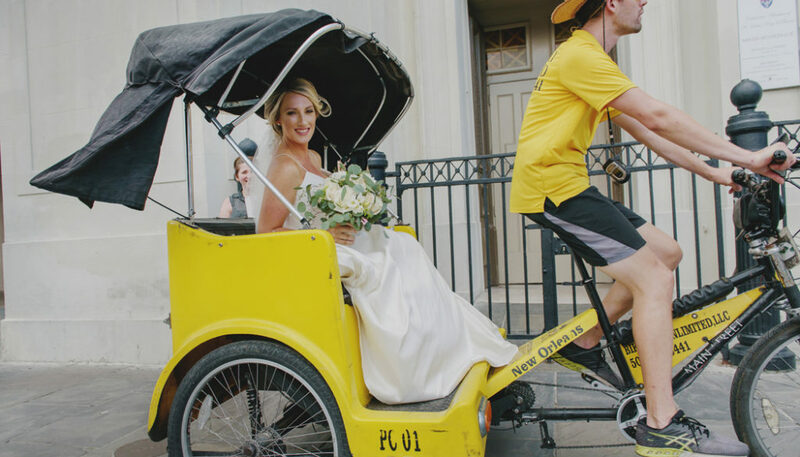 Before I knew it I was in the back of a pedicab, wearing this huge wedding dress, peddling towards my destiny. Definitely not the way I envisioned it as a little girl. 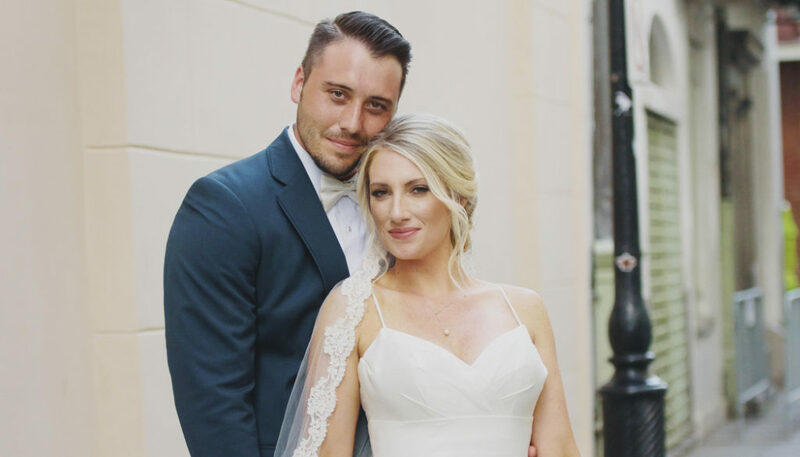 After a beautiful ceremony, we hopped into the limo expecting to be whisked away in luxury—only to find the air conditioning was broken. We spent the entire drive to Mississippi baking in an oven on wheels. 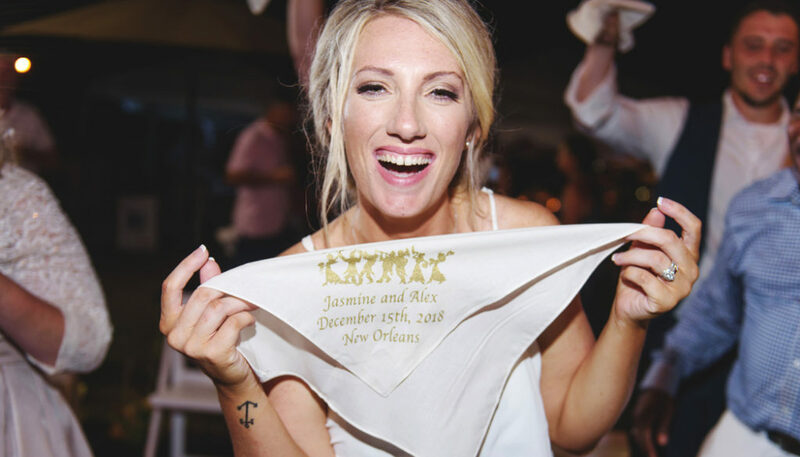 We pulled up to the reception and were promptly informed that not only had two of our tents blown into the bayou, but our wedding planner and caterer were about to rip each other’s throats out. At this point, we didn’t care if they had a thunderdome-style death match on the dance floor. We just wanted to be with family and friends, but even this was too much to ask. Alex and I ended up cutting the cake alone with the photographer and wedding planner. Aren’t our parents supposed to be here for this? Whatever, I had already given myself over to the chaos. Surprisingly, the rest of the night was pretty incredible. The reception turned into a backyard party with family and friends which suited my husband and I perfectly. And, in the end, none of it mattered because we were finally beginning our happily ever after.